Wondering what I might have missed during the recent 2017 muzzleloader season, I ventured back out to the blind the evening after the season closed to sit for a few hours and see what I might find…..no gun, no other gear, just me and my binoculars. It’s getting dark, probably 15 minutes before sunset, and I’ve seen nothing. I’m thinking I’m going to get skunked and that maybe I’ve wasted my time on this scouting trip……then everything changes. Two does come into the meadow from the north side of the field. About 5 minutes later, two more does come in from the south side of the field. They finally congregate with each other and then I spot a 9-pt buck coming in from the east. Not 100 yards behind him is an 8-pt buck that’s obviously been fighting a lot as both eye guards and his right G3 are broken off. The two bucks square off with one another, walking stiff-legged around each other, but never actually fight. So, for the next 30 minutes or more, I watch the 8-pt and 9-pt bucks chase the 4 does around the meadow, trying to get lucky……alas, it was not to be! They all leave the south end of the meadow and it’s now probably 30 minutes past official sunset. This in and of itself is a great experience as I’ve never been able to watch this type of activity for that long……that’s when it gets interesting. I’m about to get down from my blind and here comes another perfect 8-pt buck from the north side of the field, walking very close by my blind……and beds down right in front of the blind! Not 30 yds away! I’m trapped in the blind! What’s my next move? Not wanting to draw attention to myself getting down from the blind for fear of the buck associating me with the blind, I make inquiries of several fellow hunters, sending them text messages. One of them says he’s actually been in that situation before and has howled like a coyote to scare them away without alerting them to him being in the blind. Great idea, right?!? I howled and barked at that 8-pt buck a dozen times before he even got up off the ground. After a few more minutes of him just standing there looking around, I howled and barked at him again and he finally took off….only to hook up and rattle horns with a fourth buck that was in the SW corner of the field that I hadn’t yet noticed. Then they both walked out. I’m still not sure if I actually provided the impetus to get the buck up off his bed or if he’d simply spotted the other buck coming into the field. I finally get down and walk out in the dark……pitch black……I’m free!!! 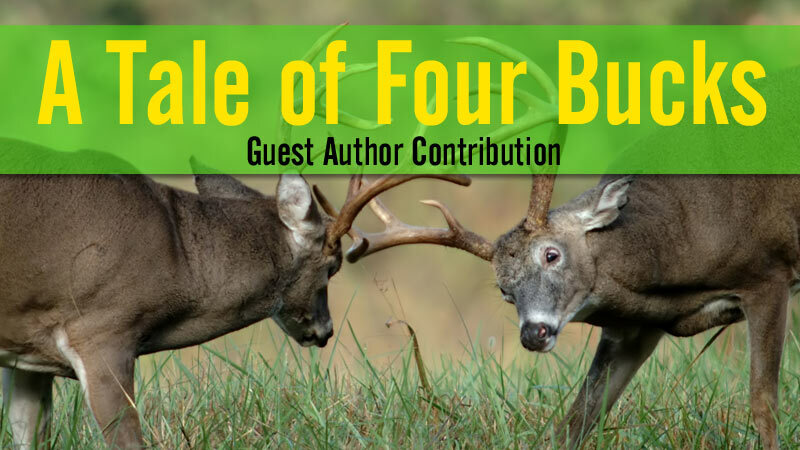 “A Tale of Four Bucks” was authored by a guest contributor. If you have a story or pictures you’d like to share, feel free to reach out to us at blog@americanexpedition.us.